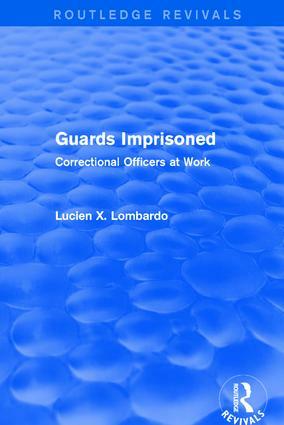 First published in 1989, Guards Imprisoned provides an in-depth look into the work and working life of prison guards as they perceive and experience it. The author, who was a teacher at Auburn Prison, New York, discovered that little was known about the guard’s perceptions of his "place" in the prison community and set out to explore the dynamics of this key correctional occupation from the perspective of those who do it. The raw data was provided by over 160 hours of interviews with guards and is presented in the order of a "natural history" — from their prerecruitment images of prison to the search for satisfaction as experienced guards. The book also includes a follow-up with the officers who were originally interviewed in 1976, assessing patterns of change and stability in their attitudes and behaviors. The Auburn Correctional Facility (renamed from Auburn Prison in 1970) was the second state prison in New York, the site of the first execution by electric chair in 1890, and the namesake of the famed "Auburn System" replicated across the country, in which people worked in groups during the day, were housed in solitary confinement at night, and lived in total silence. The facility is celebrating the 200th anniversary of its groundbreaking in 2016.